Wait till you see my Pistons, omg your not going to believe this!!! 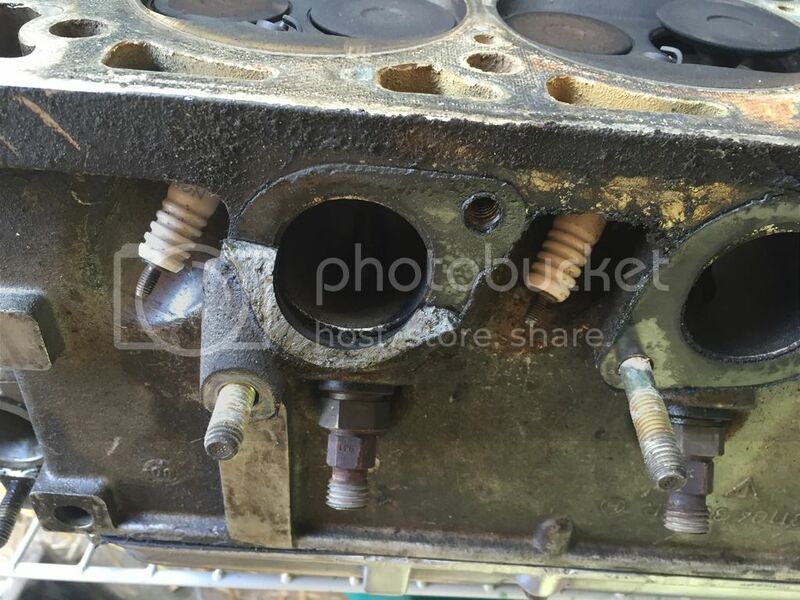 Long story short my pistons and valves look absolutely perfect..
Man I was dreading to see divots from detonation, cracks in the high squish areas, signs of broken rings etc. etc. I think those last 2 pics are my compression to coolant leak.. She would bubble a bit but only after I ragged her hard..
My exhaust wrap is toast..
All in one shot right off the top of the turbo and J-pipe.. It's going to work... 2 bolts line up on the air side and I'll make an adapter sandwich..
Won't even have to make new plumbing to the turbo, use original (but new) mounts too.. 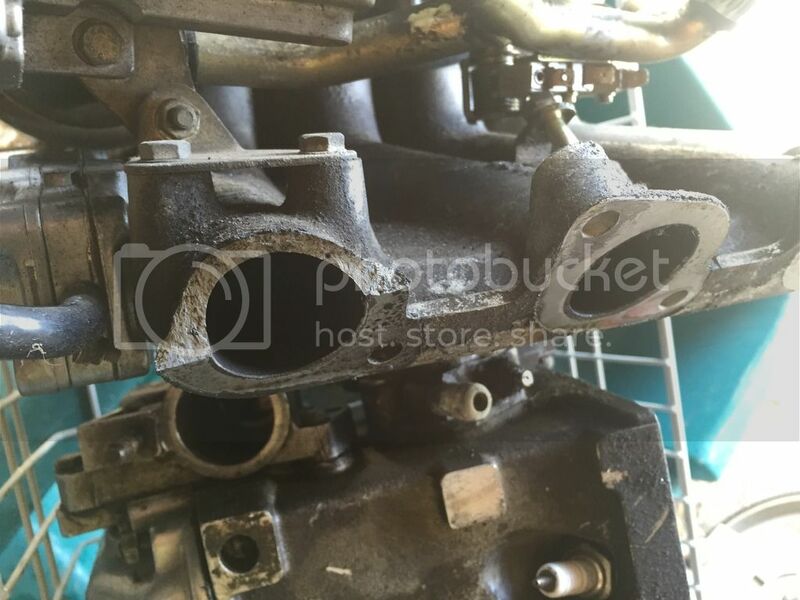 The unexpected good - Pistons/bores look excellent, what I thaught were broken exhaust studs are actually just missing but the gasket was turned slightly not letting me put a stud in there leading me to believe their were broken studs in there.. I didn't notice this happen until I pulled the intake off, I think it is most likely that I did this during disassembly at some point. Kinda balances out..
No I'm just kidding, I need a replacement 931 s1 intake.. I think I might have one that you can have for the shipping. I'll check today. Awesome man I'll tack on a tip.. The bores on these motors are quite hard. 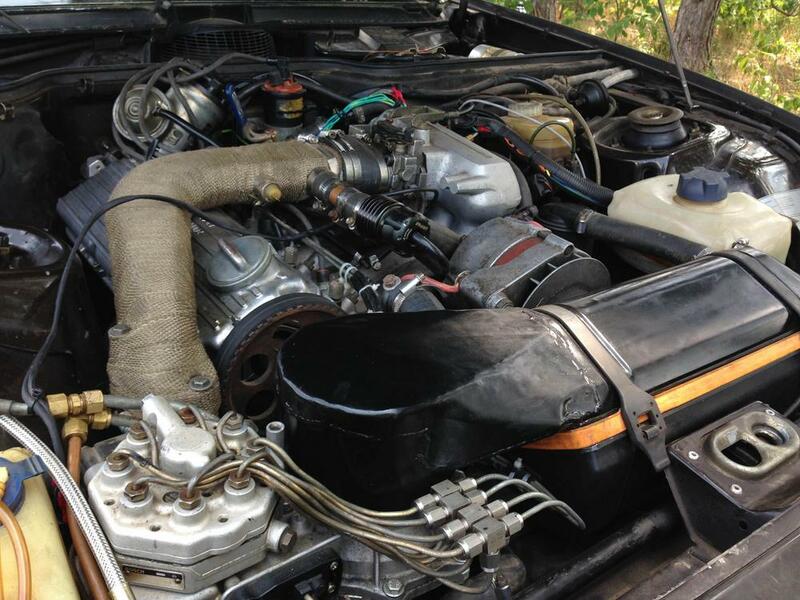 My 931 engine still had visible honing marks, but there were broken rings on every cylinder. You may not get all the info you need without pulling at least one piston, unless you already did a leakdown test. Can't justify $320 in rod bolts just to check right now, the stuff in the OP and some other supporting hardware is probably approaching $1,500.. Compression test was around 120psi on all 4 +- 5 psi, don't have leakdown tools.. I'm sure I'll do a bottom end some day, maybe sooner, maybe later..
As far as I'm concerned this one is going to run till it knocks or blows a hole in a piston then I'll get an NA short block and outfit it with non-interference pistons.. I have one. The PORSCHE script badge is missing from it, but if yours still has it, you can use a heat gun to soften the glue and remove it for transferring over to mine. Also, apparently, some previous owner installed a fitting of some sort in the back of the plenum. It looks like it may have been for water meth injection, or possibly a vacuum port. The fitting is still there, but you'll need to use it or plug it. Otherwise, it's a good S1 intake for which I have no use. If you want it, PM me your mailing address and figure out the shipping. I am curious about the Mercedes metering head, keep up the good work! Hopefuly it fits an IAT.. PM sent.. Thanks.. Engine Head fresh out of the parts washer..
Nickle rod for exhaust manifold crack..
Aluminum filler rod for porting lower charge tube..